After all the holiday partying (and drinks that ensued) it’s time to get back to business, and by business-I mean a more healthy lifestyle. One of the easiest ways to increase your overall health is by drinking more water. I know you’ve heard this before (probably about a million times) but it goes without saying that by simply drinking more water it realllly does have a positive outcome on your over health not to mention your skin looks better and aids in your digestion. 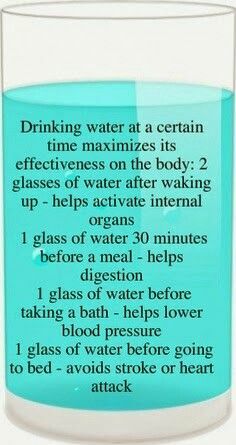 As an added bonus I’ve enclosed a little chart that I came across on Pinterest, that defines the health benefits of drinking water with certain times of the day. Here’s to a happy healthy New Year and a gentle reminder to Drink Up!